Terence was a fellow WWII Far East Prisoner of War of Albert Ient, 1942 -1945 at Habu Camp (Hiroshima Camp 5), Hitachi Dockyard, Innoshima, Japan . My continuing search for information about what happened to my father during the Second World War was greatly helped when I was given the opportunity, through working for Ericsson, to go to China and on the way back I went to Hong Kong. Hong Kong was a significant part of my parents life, and of course, that is where Dad was captured. When I returned I carried on my research and, through my brother John, I discovered the work of Terence Kelly. After flying Hurricanes against the Japanese in Singapore , Sumatra and Java, Terence was taken prisoner in early 1942. For seven months he was held in Boei Glodak, a squalid native prison before being transported to Japan with more than 1,000 fellow POWs in the ancient freighter Dai Nichi Maru. When he arrived in Japan he was taken to Habu, the principal township on Innoshima Island, and a prisoner of war camp named Hiroshima 5. From this camp he went daily to work in the Hitachi Dockyard  just as my father did. After the war, Terence became a quantity surveyor and set up offices in London and the Caribbean handling many different projects. His experiences led him to write his first novel, The Carib Sands and persuaded him to become a full-time author. His first play, A Shake in the Sun went to the West End and many more novels and plays for stage, television and radio followed. In addition, Terence has written a number of non fiction books, including, By Hellship to Hiroshima which is the up-dated version of Living with the Japanese. Both of these books vividly describe of his experiences as a Far East prisoner of war and, of particular interest to me, what life was like in Hiroshima Camp 5, his relationship with his captors and men from the Hong Kong Volunteer Defence Corps and work in the large Hitachi shipyards. Terence Kelly died in September 2013. 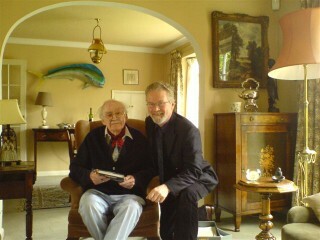 In March of 2007, I was privileged to meet Terence at his home in Marlow. We talked about many things relating to his captivity and possible connections with my fathers experiences. For instance the incident both men recalled when a request to go swimming was agreed to and how they were marched into the freezing cold sea, in the dark at night; and their mutual friendship with Geoffrey Coxhead, the English artist and diarist. The following notes are a record of that discussion. Well, what I mean is that the invasion force of Japanese was so modest, that any real effort to fight against them, in a country of 60 or 70 million people and 600 miles long, hilly terrain and God knows what  should not have presented a problem, but it did because nobody fought them!...Disgraceful. Terence stayed in Hiroshima Camp 5 for the remainder of the war from 1942 to August 1945. The prisoners held there were not transferred to another camp even after the allied bombing of the dockyards and the camp itself in 1945. 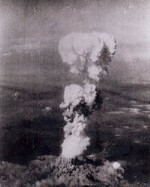 (See also the article on this web site titled: Hiroshima #5 Prisoner of War Camp). 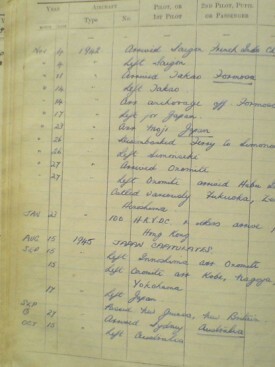 He was, he said, The only pilot who kept their log book through a Japanese prisoner of war camp, everyone else destroyed theirs, because we had been busy strafing the Japanese. From this he confirmed that on the 23rd January 1943 100 (mostly of the HKDVC plus some regular soldiers) arrived from Hong Kong on the passenger liner Tatsuta Maru. Their journey, to the best of his knowledge, had been relatively uneventful. 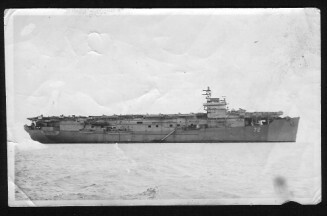 Albert Ient was one of the prisoners on this ship. He was an old man, as bad tempered as can be, but he was delightful, one of the Japanese I really liked, and he had been looking after these travelling cranes ever since he was a child. He was in charge of us and we had a Korean guard who was considerably unpleasant. We were a party of our own. Other people worked on ships or things. Here Terence asked which working party Albert had been with, but unfortunately I did not have this information. I was able to say, however, that my father had been involved in building ships and working with metal. Terence confirmed that this was, of course, very possible and small working parties of about 17 or 18 people had undertaken riveting work on the ships. Terence felt that they had been quite fortunate with their camp commandant, who was regarded as quite a weak man, concerned only with himself and avoiding any trouble. Although a well educated man he did not hold a very high rank. Terence concluded that, on the whole life could have been a whole lot worse than with Nimoto. Despite the rigors of prison life humour in the camp was still very much alive. This menu was made up by Terence after receiving a Red Cross parcel in October 1944. This was probably the first for over 2 ½ years! We had this one particularly fearsome raid. They killed a lot of Japanese. They didnt kill any POWs  we were not in the camp but at the dockyard at that time. They sunk a submarine though and damaged the area quite badly. Later in May that year things took a more portentous turn. We saw these huge formations coming over. We couldnt count them. I always remember; some day in May, there was lots of cumulus cloud. Out of it appeared the nose of a B.29 and then there was another one and another one and eventually you got a formation of 27 on each side. Then as that came out, another formation of 27 making it a formation of 81 and eventually there were three or four hundred B29s and they just went straight overhead thankfully. We heard them bombing somewhere else. I dont know where it was. But we were fortunate because records show that the Americans had decided to carry out complete pattern bombing, with these huge forces, of our dockyard on the 18th August. That was three days AFTER the war ended! Hiroshima where they dropped the first atomic bomb on the 6th August 1945, was only about 24 miles from the POW camp where Terence and Albert Ient were interned and it was this distance and the fact that the terrain in between was hilly that prevented them from seeing what happened. a formation of 200 to 300 B29s dropped all their bombs on an area, and even if it was 30 miles away, we continually heard rattling. But we didnt know about the atom bomb. What was strange was that we obviously saw the aircraft which dropped it, because, curiously, on that very day when they dropped it, we were working in the dockyard and a single B29 came over. Leading up to the end of the war, things in the camp had got a lot worse. 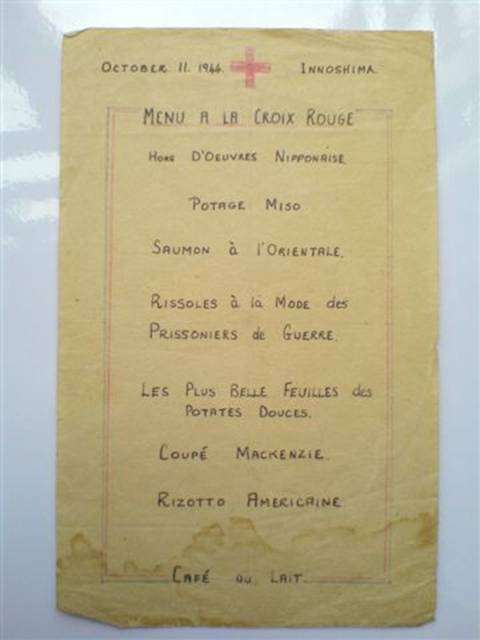 The prisoners were very close to starvation and the Japanese themselves were not well fed. Terence felt that if the war had gone on the death toll would have suddenly become enormous, because there just was not any food. Rations had been severely cut, to the extent that they were miniscule. See also: Conditions & Routines in Hiroshima #5 PoW Camp on this web site. In fact, there were not many Japanese troops on the island. The camp had a permanent staff guard and a small batch of between six and ten soldiers who came for one month and were then replaced by another batch; there were sailors who came off ships; or if a troop ship came in then there would be a lot of army in the dockyard, but, by and large, the prisoners did not see large numbers of Japanese army personnel. When the war ended the guards who had looked after the prisoners stayed in the camp, but as Terence says, they made themselves as invisible and as small as possible. I decided something had to be done. Why me, I dont know, because I was only a youngster. Anyway, I did. I said to the Commandant, look weve got to have a meeting for food so he said, well, who do you want at the meeting? I said, well, we want you and we want the bank manager and we want the man in charge of food on the island and we want an interpreter. Anyway, we had this meeting in the boardroom of Hitachi dockyard! I wasnt the only one. There was a sergeant from the Hong Kong group as well. He didnt say very much I remember, but he was there. And we sat at this table and I started to lay down the law as to what we should have. Terences log notes that the war officially ended on the 15th August, but it was sometime in September before the first Allied officer arrived. As Terence related to me and also as noted in his book, on Tuesday September 11th a small pinnace came round the headland flying the White Ensign and shortly afterwards a British officer stepped ashore to tell us that we were all going home. With some amusement Terence remembered that the officer said he couldnt stay long and boarded his boat again and disappeared again round the headland! The short visit was, in fact, to give details of the PoW departure from the camp. I am deeply grateful for the opportunity to have spoken to Terence. The conversations we had ranged over many topics and provided me with factual and anecdotal evidence about life as a FEPOW that I would never had found elsewhere. And so, importantly for me, he answered the questions I wish I had asked my father, but never did. At the time of Terences arrival the camp was called Fukuoka 12, it was subsequently renamed Zentsuji 2 and later again renamed Hiroshima 5. T Kelly has a copy of the diary Coxhead kept throughout this captivity in Hiroshima 5. Batavia, now known as Jakarta, is the capital and largest city of Indonesia , located on the northwest coast of the island of Java. 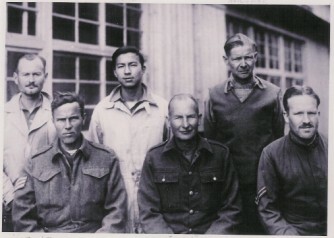 Victor felt that it could be possible that Albert was the only member of the HK Royal Signal Regiment in this camp. Although Levetts War Diary claims that the third draft included 6 of his men. 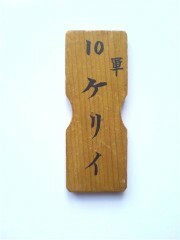 Victor remembers playing with his fathers bamboo tag when he was a boy, unfortunately it is now lost. Victor has the cards Albert sent to Toby during his internment at Hiroshima 5. 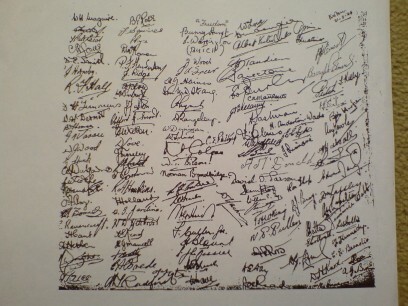 Date given in By Hellship to Hiroshima, p224, as 11 September 1945.